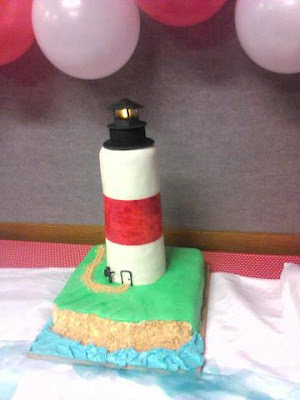 This lighthouse cake was made for a special evening with the young women at church. The theme was Keepers of the Light. The decorations were beautiful and the program was inspiring. The lighthouse cake was reflecting the theme. It was a vanilla cake with a lemon mousse filling and vanilla buttercream frosting. A sheet cake base and three tiers of cake rounds for the lighthouse. There was a tealight in the top with cast sugar windows.